Health workers lined up to get vaccinated against Ebola in the Democratic Republic of the Congo on Monday, just as officials there said a nurse had died of the virus. It’s the first time vaccines have been used to fight a new outbreak of the virus, which has infected 49 people and killed 27 of them in the sprawling central African nation. WHO hopes quick use of vaccines can prevent the kind of explosive spread that ended up infecting 28,000 people and killing more than 11,000 of them in the 2014-2016 outbreak in West Africa. “This is an important step for a vaccine with huge potential. Clinical trials have shown that the Ebola vaccine is safe and highly effective,” said Dr. Seth Berkley, head of the Gavi vaccine alliance, which has contributed $1 million to help in the immunization effort. WHO is starting with doctors, nurses and other staff in the river port town of Mbandaka. The global health agency has 8,000 doses of vaccine to distribute and wants to focus first on urban areas, because the potential for fast spread is higher there. "It cannot be just vaccination." "The health staff are the first ones who are giving care to the ones that are sick," said Dr. Micaela Serafini, medical director for Medecins Sans Frontieres (MSF or Doctors Without Borders). Health workers are at special risk in an Ebola outbreak: More than 500 were killed in the west African epidemic. Although they wear extensive protective equipment, they’re also in extended close contact with the very sickest patients, who are the most infectious. Congo officials said Monday a nurse died in Bikoro, a town near where the current outbreak began. Often some of the first victims in any outbreak of Ebola are healthcare workers, said Serafini. MSF operates two clinics in the affected area. It’s also easier to get the vaccine to a city. The experimental Ebola vaccine must be kept at super-cold temperatures, a challenge in a country with few roads, patchy electricity and where the preferred method of transport is motorbike. “Given the remote location and limited road access to the populations affected in the current outbreak, implementing ring vaccination and maintaining the required -80⁰C cold chain presents major logistical challenges for the Ministry of Health, MSF, WHO and other partners on the ground,” WHO said. But there's good news, said Serafini. Merck, which makes the vaccine, said it can be safely kept at just-above-freezing temperatures for several days before being administered. "That means we can transport it in a typical cold box that is used for other vaccines," she said. And that would make it easier to transport to the more remote town of Bikoro, where the outbreak started, she said. “The DRC government, alongside the WHO, MSF and others, are working hard to slow the spread of Ebola. We now hope that deploying the vaccine will give a vital boost to these efforts, helping to defeat this outbreak," Berkley said. 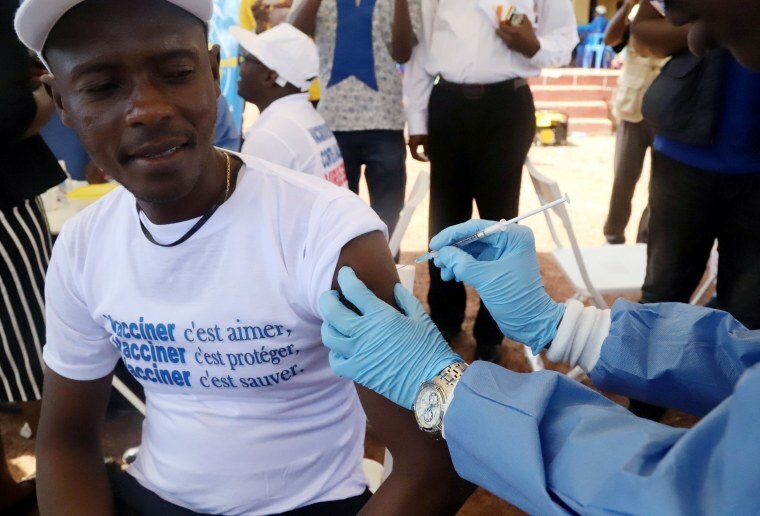 The vaccine was used experimentally in 2016 at the end of the Ebola epidemic in Guinea and evidence suggests it was 100 percent effective in preventing more cases. Some of the people who took part in that vaccine experiment are on hand in the Democratic Republic of the Congo to vaccinate people there. Is Ebola deadly? Questions about the killer virus, answered. They are using the same technique used in Guinea and used to eradicate smallpox in the 1970s. Called ring vaccination, it starts with health care workers. Then all possible cases of Ebola are tracked down and all people who have been in contact with them are traced and vaccinated. After that, the contacts of those contacts are traced and vaccinated. “As of 21 May, Merck has provided WHO with 8,640 doses of the (Ebola) vaccine of which 7,540 doses are available in the Democratic Republic of the Congo (approximately enough for 50 rings of 150 people),” WHO said. There's no specific treatment for Ebola, although there are experimental therapies. Fast, specialized supportive care can help more patients survive, but the mortality rate is usually above 50 percent for Ebola. Serafini said vaccination alone will not be enough to stop any Ebola outbreak. ""I do understand that there is a lot of emotion when it comes to to this vaccine, because it is a new thing," she said. "But it cannot stand alone. It cannot be just vaccination." Safe burials of the dead, quick identification and treatment of cases, and education about how Ebola spreads are also required to fight any outbreak, she said.